A breathtaking spectacle awaited the athletes and hundred thousand plus visitors expected in Garmisch-Partenkirchen for the World Skiing Championships in February: during the opening ceremony in the Olympic Stadium and each evening’s medal presentation ceremonies, in the course of a lavish lightshow visible way beyond the limits of the Garmisch-Partenkirchen district, a bridge was fashioned in the night sky linking the three main competition venues: the Olympic Stadium, Kandahar and Medal Plaza. 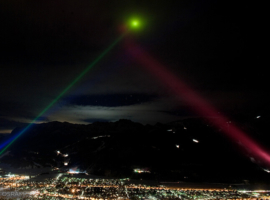 The effect was achieved through the deployment at each of the three venues of high-powered searchlights the beams of which was intersected at a point in the night sky equidistant from all three. 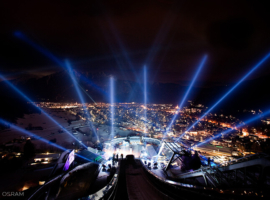 With blue beams emanating from the Olympic Stadium, red from the Kandahar downhill run and burnished gold from Medal Plaza, the bridge was resplendent in the colours of the FIS (Fédération Internationale de Ski), which had organized the event. 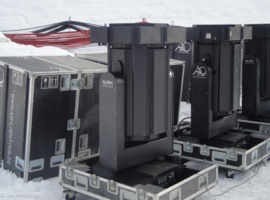 For the light show on opening night, a total of thirty-eight FALCON high-powered xenon searchlights of the kind often seen at major concerts and outdoor events were deployed. 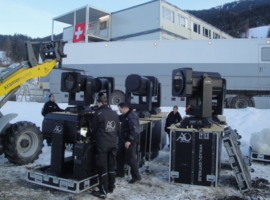 They were equipped with OSRAM XBO 7 KW lamps. 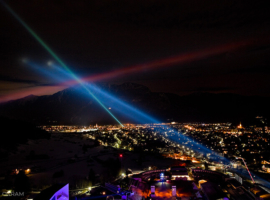 Thanks to the extremely high luminance and excellent colour reproduction of these high-intensity discharge lamps, the illumination of the night sky over Garmisch-Partenkirchen should be nothing if not impressive. 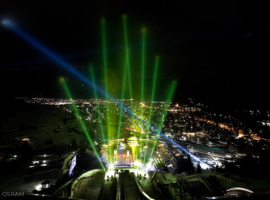 A further 4,500 coloured OSRAM high-powered LEDs in the Olympic Stadium and Medal Plaza contributed additional colour and dazzling effects to the opening ceremony and medal presentations. 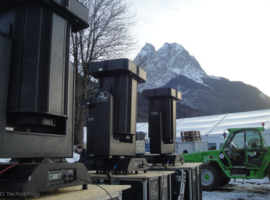 As was the case with the illumination recently of the 60-foot-high bronze statue of the Goddess of Bavaria during the 200th Oktoberfest in Munich, the technical realization of the light show was the responsibility of A&O Technology. 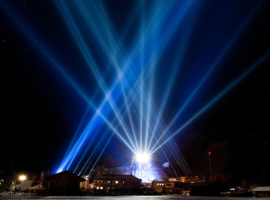 To create the bridge of light, which was visible nightly from 5pm to 10pm in the sky over Garmisch-Partenkirchen, over sixty FALCON xenon searchlights were used. 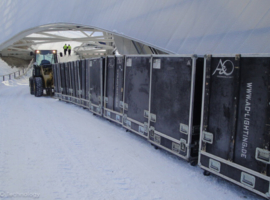 Eighteen FALCON 6000 CMY units were positioned in the upper tier of the Olympic Stadium, whilst three FALCON BEAM 7000W and eight FALCON FLOWER 3000W units were placed on the ski jump, the landing area of which was converted through the use of video projectors into a giant canvas. At the take-off point, the beams of ten FALCON BEAM 7000W units composed the pier of the Olympic Stadium span of the bridge at Gudiberg. 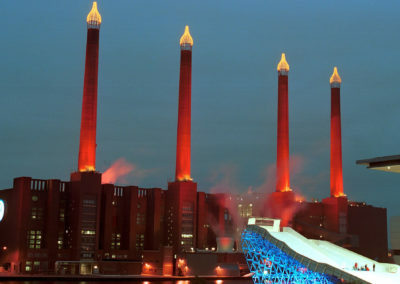 At Medal Plaza in World Championship Park, three FALCON BEAM 7000W and twelve FALCON BEAM 3000W units formed a second pier. 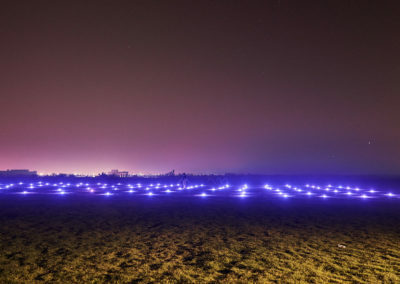 The third pier was sculpted by nine FALCON BEAM 7000W searchlights in the Kandahar Arena. The opening show paid tribute to the contributions to world culture of local figures such as composer Richard Strauss and children’s author Michael Ende, by drawing upon themes from works such as the “Rosenkavalier” and “Momo”. The construction each evening of the bridge of light began with the creation of a 4-minute frozen image: a white pyramid of light. 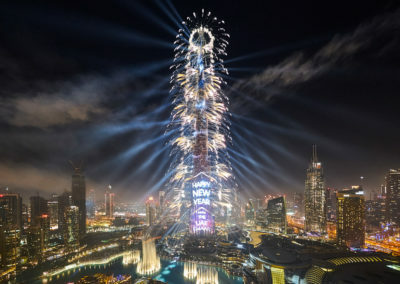 Only then the orientation of the beams slowly changed to compose a bridge in the sky in the colours of the FIS, with the colour blue assigned to the Olympic Stadium, red to the Kandahar Arena and burnished gold to Medal Plaza. This constellation, too, however, proved transitory as the beams reverted to their original configuration and the pyramid of white light reappeared. 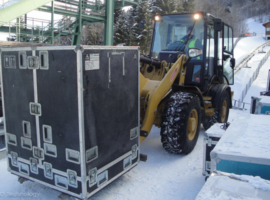 This sequential networking of the competition venues breaked off at 10 pm nightly throughout the World Skiing Championships 2011 to resume from the start the next evening at 5 pm.